Jan. 21 (UPI) — House Speaker Paul Ryan said the chamber would support a Senate bill to temporarily end the U.S. government shutdown as it entered its second day. 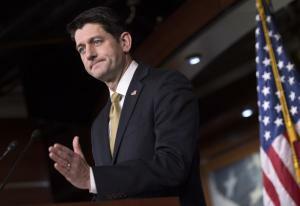 Ryan, appearing on CBS’ Face the Nation, said the House will back a short-term deal to fund the government through Feb. 8 if the Senate is able to pass one when both chambers reconvene Sunday afternoon. “We have agreed that we would accept that in the House and so we will see sometime today whether or not they have the votes for that. And that’s really where we are right now,” Ryan said. The government shut down on Friday when the chamber failed to cast the necessary 60 votes to pass a stop-gap bill to fund the government through Feb. 16. Sen. Lindsey Graham, R-S.C., said a resolution that would fund the government in exchange for a vote on immigration would help draw support in the Senate. “After extensive discussions with Senators, on both sides of the aisle, I believe such a proposal would pass if it was understood that after Feb. 8, the Senate would move to an immigration debate with an open amendment process if no agreement has been reached with the White House and House of Representatives,” Graham said on Saturday. U.S. President Donald Trump shared a tweet Sunday morning, encouraging McConnell to invoke the so-called “nuclear option” and eliminate the 60-vote threshold to break a filibuster. “Great to see how hard Republicans are fighting for our Military and Safety at the Border. The Dems just want illegal immigrants to pour into our nation unchecked. If stalemate continues, Republicans should go to 51% (Nuclear Option) and vote on real, long term budget, no C.R.’s!” Trump wrote. Eliminating the 60-vote threshold would allow Republicans to use their 51-member majority to break the filibuster. White House budget director Mick Mulvaney told CNN’s State of the Union eliminating the 60-vote threshold is one of “a bunch of different ways” to end the government shutdown, but suggested Democrats could also cross the aisle to provide the necessary votes. “Get some of those Democrats who say back home they want to work in a bipartisan fashion, they want to work with Republicans, but don’t,” said Mulvaney. “We have to acknowledge our respect for the minority,” he said. The nuclear option was used in April to prevent Democrats from filibustering the nomination of Neil Gorsuch to the Supreme Court.